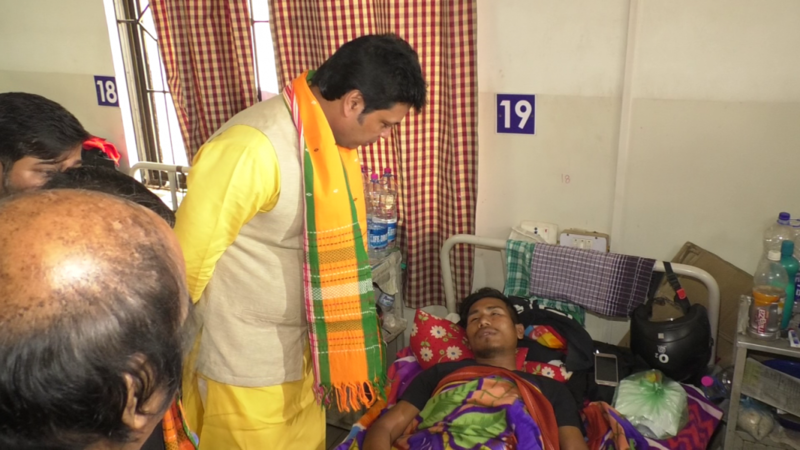 Tripura Chief Minister Biplab Kumar Deb on Saturday visited Madhabbari where five protesters and an TSR jawan were injured as the police opened fire on protesters, who had staged protest against the Citizenship (Amendment) Bill, 11 days back. Chief Minister Deb also met the victims in the hospital and declared that the State Government would provide a compensation of Rs 1 lakh to each of the injured and Rs 50,000 to the shopkeepers, who had suffered in course of the clashes. On January 8 last at Madhabbari at least five picketers and one Tripura State Rifles jawan were injured in clashes between the strike supporters and security personnel during two-day strike called by the North East Students’ Organisation (NESO) sparking widespread uproar across the State. Earlier, CM Deb met the injured persons in the GB Pant Hospital from where Chief Minister Deb, accompanied by Tribal Welfare Minister Mevar Kumar Jamatia and MLA Sushanta Choudhury along with other health and police officials went to Madhabbari area to meet the shopkeepers, who also suffered in course of the clashes. Deb also announced a probe into the allegation that police had attacked injured persons and the attendants who were moving in an ambulance towards hospital in Agartala on the day of the incident and the police intentionally opening fire at a statue of a former king of Manikya dynasty. Meanwhile, the victim shopkeepers have demanded a permanent police picket in the area as the situation is yet to be normal. They hoped that they would receive the compensation money at the earliest so that they could restart their business. More than 21 shops were gutted on the day of the incident. Earlier, former Chief Minister Manik Sarkar, Tripura royal scion Pradyot Bikram Manikya Debbarma and CPI(M) leader Jitendra Chowdhury visited the spot and met the victims. All of them have viewed that the firing could be avoided. The IPFT, which is the partner of the Tripura coalition Government, along with the opposition parties have demanded a judicial probe into the incident though the State Government has ordered a magisterial probe.